Best of the Week: Amazon Alexa coming to Sonos, B&W's new subwoofers, Tidal Masters and more | What Hi-Fi? 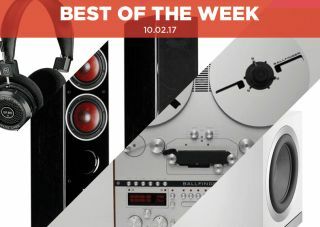 This week B&W announced its most powerful range of subwoofers, Ballfinger revealed a retro-styled reel-to-reel deck and turntable and Sonos confirmed the presence of Amazon's Alexa voice control in its speakers later this year. We have many reviews of hi-fi and home cinema kit, including Dali's powered Zensor 5 AX speaker, Grado's open-backed SR80e headphone and Audio Research's GSi75 integrated stereo amplifier. It's also new What Hi-Fi? week, with the March issue now on sale. In it you'll find reviews of wireless speakers, budget turntables, over-ear headphones and more. Plus our usual array of First test reviews, news about hi-fi and home cinema and the latest bargains to be found in our Buyer's Guide. MORE: March 2017 issue on sale now! B&W has revealed a new range of subwoofers called the DB series. According to B&W, the DB1D, DB2D and DB3D are the most powerful subs they have produced. They follow in the footsteps of the BD-1, but utilise new digital technologies including Dynamic EQ and Room EQ. Arriving in March with a choice of three finishes, the cheapest is the DB3D at £2300. For fans of retro audio gear, German brand Ballfinger (an odd name to be sure) has created a new reel-to-reel tape and turntable. Combining retro tech with a modern aesthetic, the Tonbandmaschine reel-to-reel is aimed at industry professionals and can take up to 12in tape. The Schallplattenspieler PS 2 deck is a directly driven turntable, with active radial arm and moving coil system. Sonos is bringing a free firmware to its speakers that will enable Amazon Alexa voice control. During an event at the company's Boston headquarters, Sonos also confirmed that Alexa support is on track to launch later this year. "The end of our time with Dali's Zensor 5 AX, we loved them"
Fast, detailed and enthusiastic, the Zensor 5 AX is most definitely a speaker from Dali. Offering a one-box, powered hi-fi solution, it's a neat and convenient pair of speakers with an excellent sound. However, careful positioning and choice of partnering is key with these speakers; otherwise performance may be lacking. "The Grado SR80es are exceptional and exceptionally odd headphones"
Grado is one of the more eccentric headphone makers out there. And a prime example is the company's SR80e open-backed on-ear headphones. They're a rare specimen indeed - a lively pair of headphones with excellent treble and midrange detail. The full-on listen may not be to everyone's taste, but the SR80es perform with confidence and style. "We’ve fallen for this amplifier, big time"
The thinking is that separates offer better performance than a one-box solution; Audio Research's GSi75 valve amplifier refutes that thought. There's excellent detail to be uncovered, with great dynamics and a sound that's transparent and subtle. For the best performance, careful partnering is needed. If you want quality without the quantity (and can afford it), have a look at the GSi75. We think it's rather special.